This Roast Lamb Shoulder Recipe is an old family recipe from a dear friend. 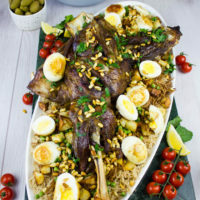 It’s the perfect Easter dinner plate with succulent roasted whole lamb shoulder over rice, peas and buttered hard boiled eggs. 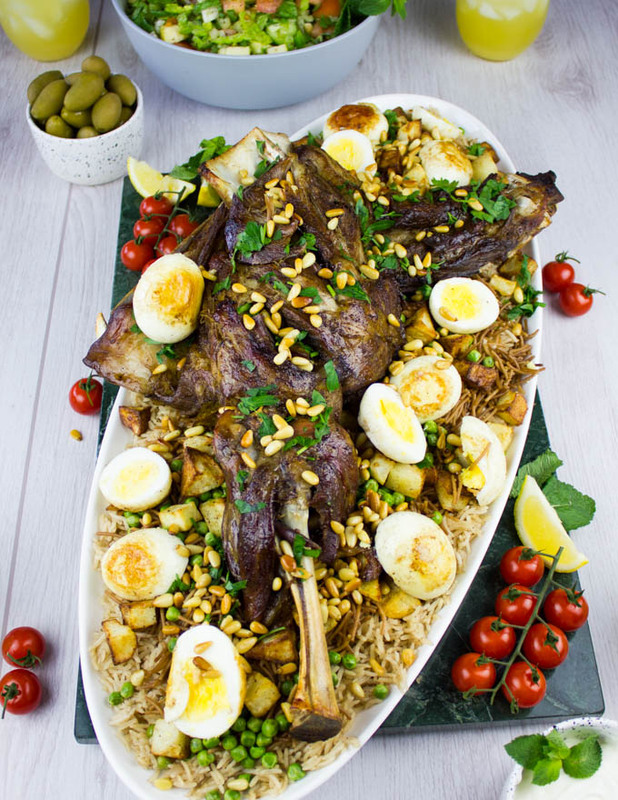 Today’s succulent lamb recipe is sponsored by my friends at American Lamb Board. All thoughts and opinions are my own. 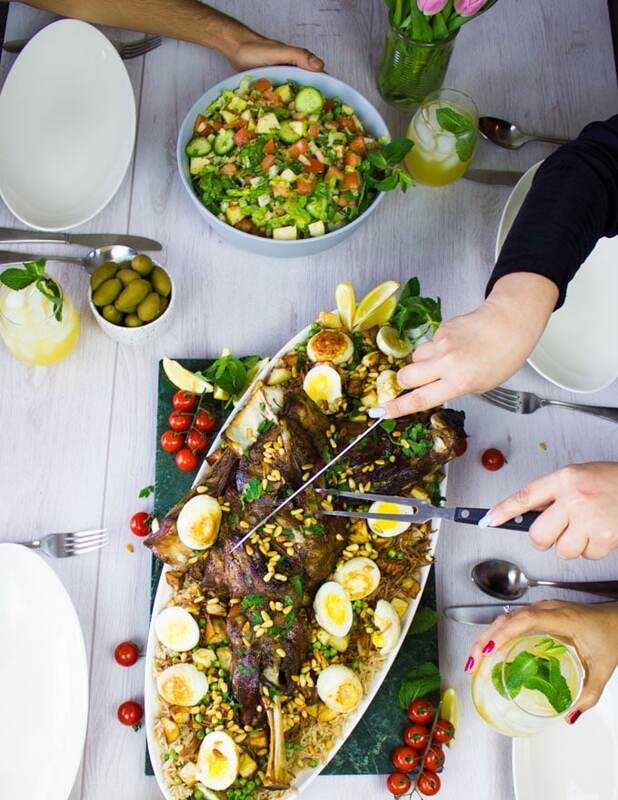 Super excited to share another roast lamb recipe. 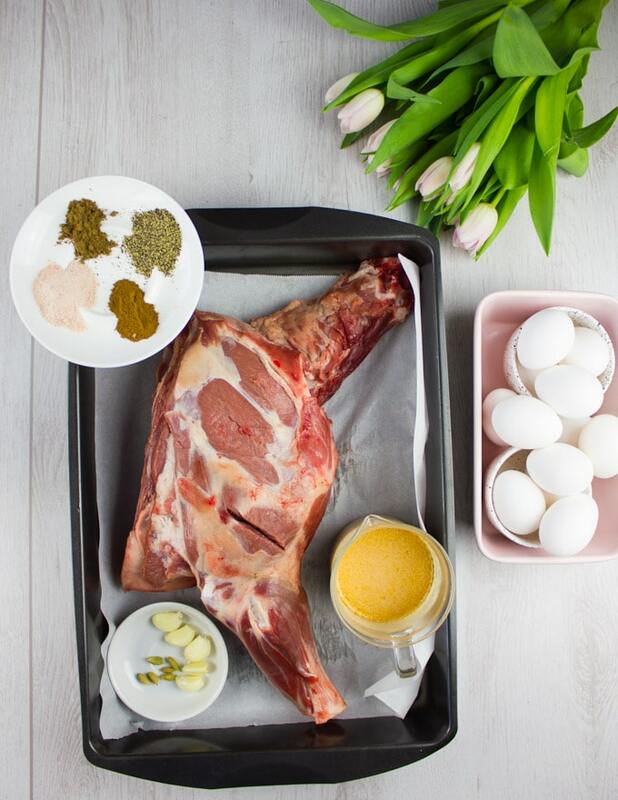 There’s nothing like American lamb when it comes to quality, taste and freshness. So don’t compromise! Especially when you’ll be marinating, roasting and enjoying lamb with company. Make sure you ask for American lamb before buying, I always do that! Compared to a whole leg of lamb ( check out this Leg of lamb with mashed potatoes recipe), the shoulder need probably a third less of the time. Another thing about lamb shoulder is the cut itself has different textures and marbles of fat. So that makes it ideal for those who prefer a less fatty cut or those of us who LOVE those marbles of fat! And while lamb in general is a very forgiving meat to cook, I feel the leg and shoulder are especially the most. You never have to worry about over cooking your lamb shoulder, it’ll always be super juicy! Also don’t worry about marinating times, it’s naturally flavorful. 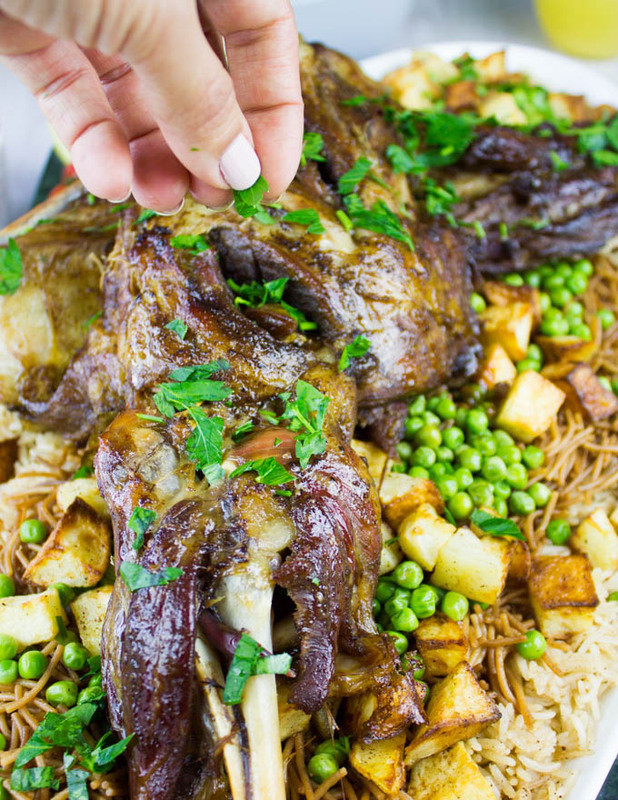 My friend’s mom used to make this roast lamb shoulder over flavored rice, some cooked vermicelli noodles, roast potatoes, green peas and hard boiled eggs seared in brown butter. Since the mom has passed away, my friend has carried away this meal and makes it for special occasions. Today is one of them and I’m super excited to share such a delicious old and classic family recipe with you! It’s one of those dishes that’s really made with LOVE. Every step of it, every layer, every ingredient, every bite is just pure LOVE. I felt it’s the best way to bring family and fiends together this Easter! So I asked my friend to help me make it, photograph it and share it with y’all 🙂 Hope you make it and taste that love! And a big thank you to Wasan and her Mom for sharing this! I almost always prefer roasting my lamb shoulder over braising or any other technique. Roasting for me really concentrates and brings out the flavors of lamb and the marinade. Always start off by buying American lamb and only American lamb for quality lamb. I can’t stress this enough! Not only will you be supporting local hardworking and loving ranchers, but you’ll also get the BEST lamb you can get. So it’s a win win. 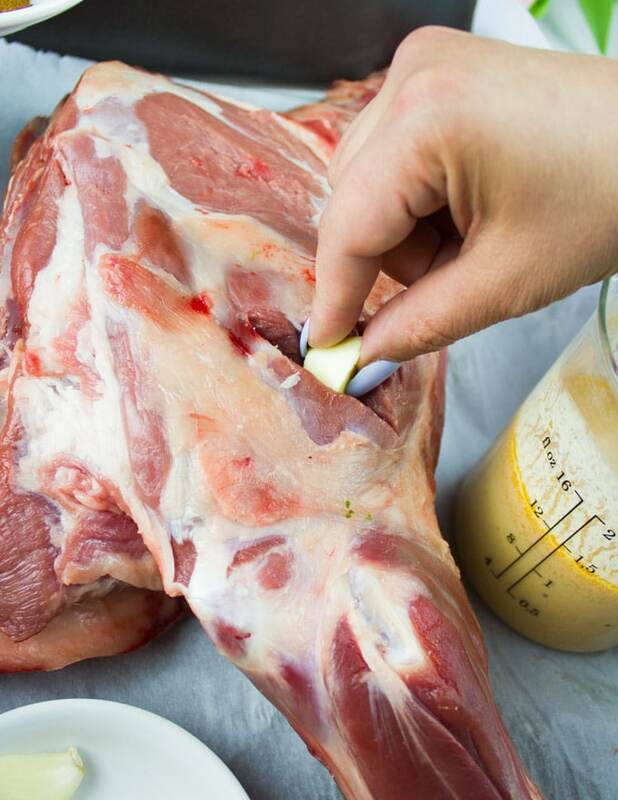 Pat dry your lamb shoulder really well and make slits in your shoulder using a knife. Start by infusing flavour and insert sliced garlic and cardamom pods into each of the slits. I shared this technique before in my Leg of Lamb with Mashed Potatoes recipe and video so check it out! Don’t over do this part, you need about 8 slits in total. Then you’ll be mixing a dry spice blend of salt, pepper, allspice and 7 spice blend. Likewise, don’t over do the dry rub. Just rub that mix all over the lamb shoulder. Now for tenderizing and infusing extra juicy-ness to your lamb shoulder, you’ll need a wet marinade. For this, you’ll need Greek yogurt, ketchup, soy sauce, how sauce, balsamic vinegar, olive oil and brown sugar. You’ll mix everything together and pour it over the lamb shoulder, massaging it all over. Right before roasting, add some halved onions and more garlic cloves around the lamb and start roasting it. Roast your lamb covered, with an extra bit of stock added for more favor and also to make your shoulder extra juicy. As the lamb shoulder is roasting, you’ll need to get along with the remaining ingredients. It may look like plenty of steps, but I promise and I assure you, it’s ALL worth it! First of all, cook the rice with the 7 spice blend. 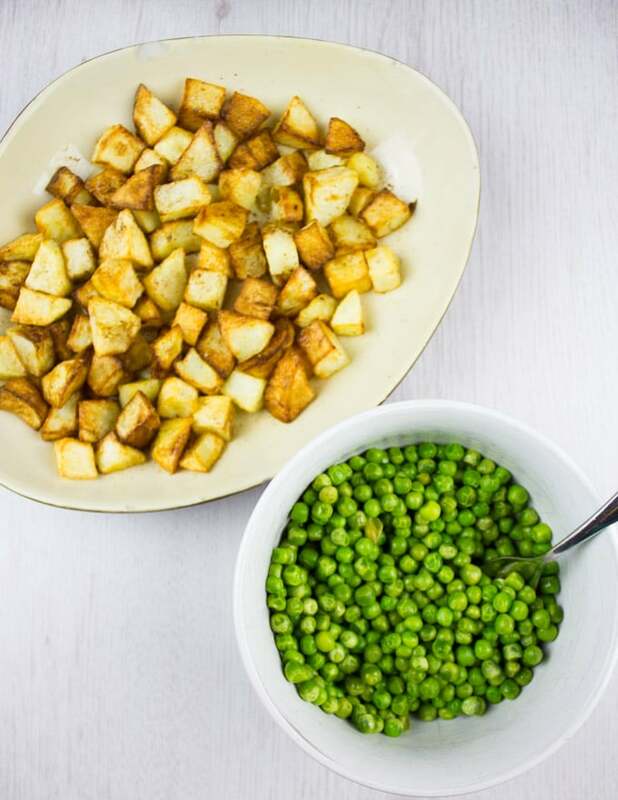 Air fry or roast some potatoes cubed. Also boil or microwave some frozen peas and have them ready. 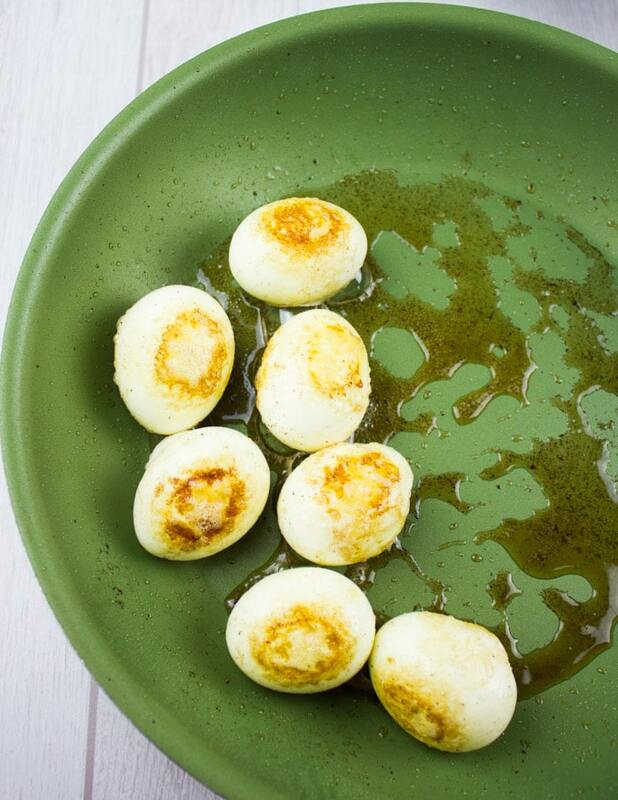 Another thing that’s unusual but so very important and tasty here is the hard boiled eggs seared in brown butter. Just hard boil your eggs as you would usually do and peel them off. Heat up a skillet over medium high heat with unsalted butter until the butter starts to brown. You can probably use ghee too. Add in the hard boiled eggs and start rotating the pan around so the eggs get a nice golden buttery crust. Set them aside to cool, and then slice each egg in half. Finally the vermicelli noodles. Pan fry them in butter until golden and then add some stock and cover the pan, cooking the noodles over low heat util tender. 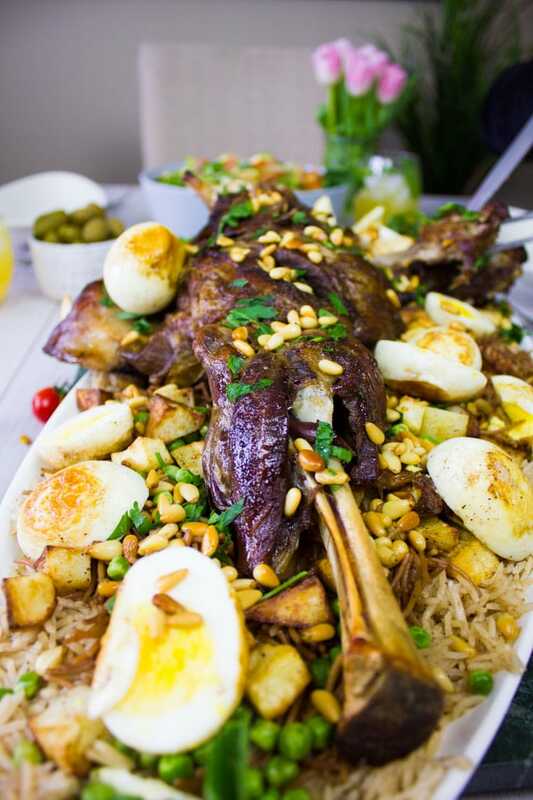 Now assemble your show stopping one of a kind Easter Lamb dish. 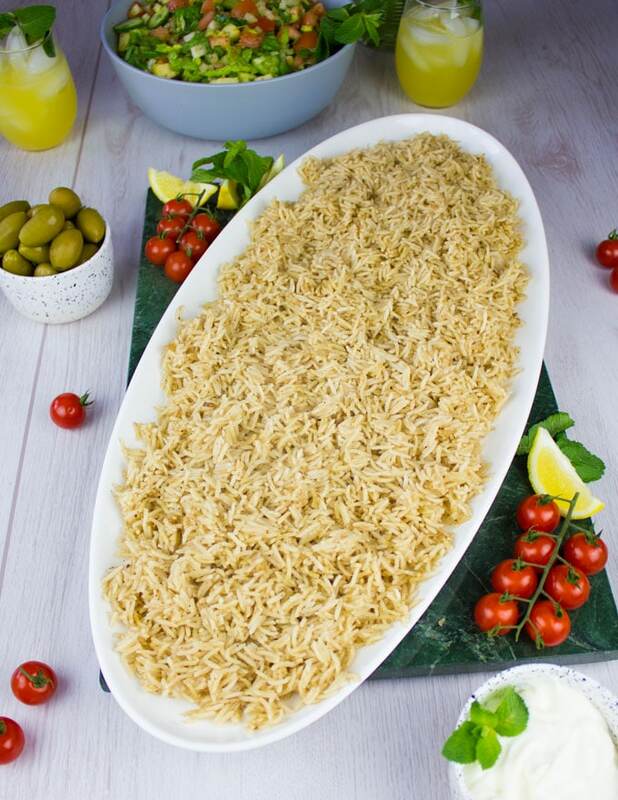 Serve the rice in a large plate. Top it with the noodles. Then potatoes and peas mixture and place the roast lamb shoulder over that. 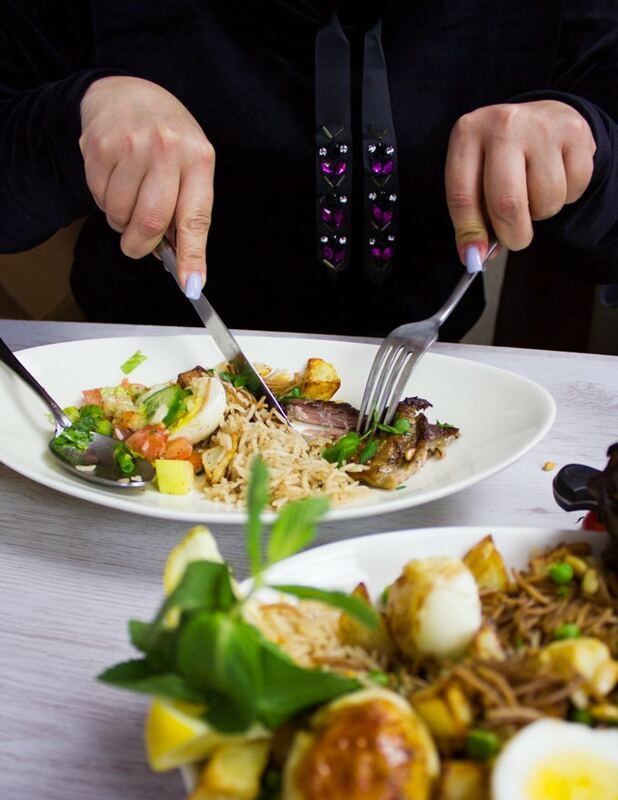 Finish off with the hard boiled eggs around the lamb. Garnish with some fresh chopped parsley and toasted pine nuts. This roast lamb shoulder recipe is the hero of any table, so you really don’t need much around it to impress. Just a nice bowl of salad, some marinated olives and cool Greek yogurt raita. Now dig in and ENJOY!! Happy Easter to you my friends! 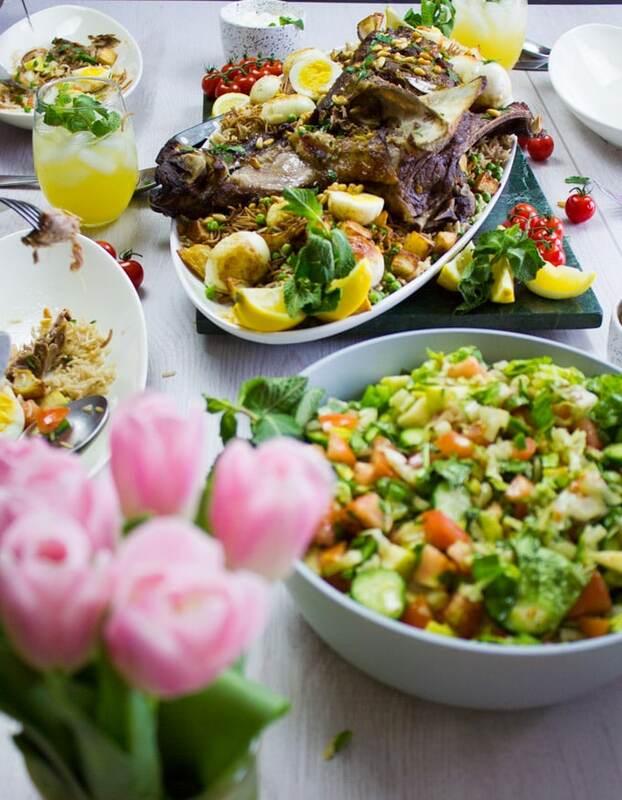 Wishing you a sweet Holiday with lots of delicious Easter Lamb and divine Easter chocolates! -Always buy American lamb with highest quality lamb meat. -Make sure to trim some fat off your lamb shoulder, but not all of it. 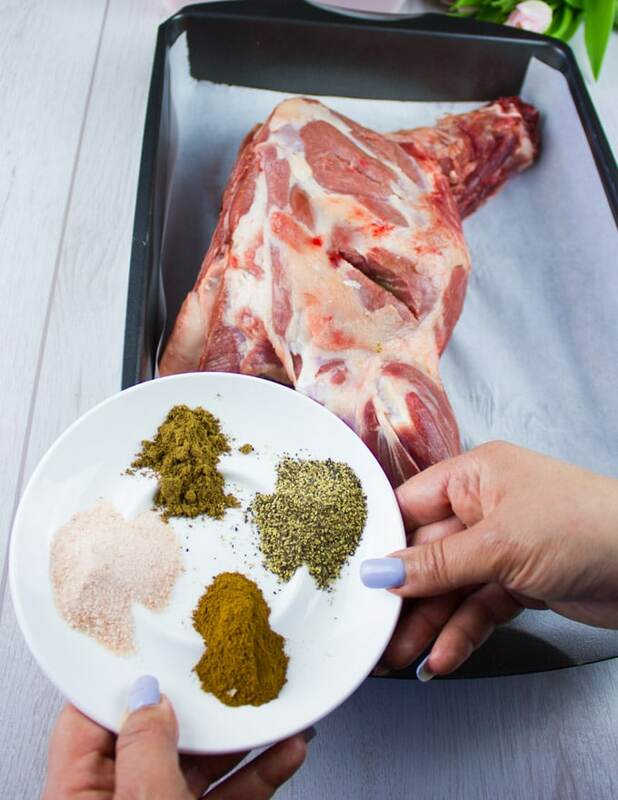 -Follow the flavouring steps of making garlic slits in the meat, a dry spice blend and a wet marinade for maximum flavor and super juicy meat. 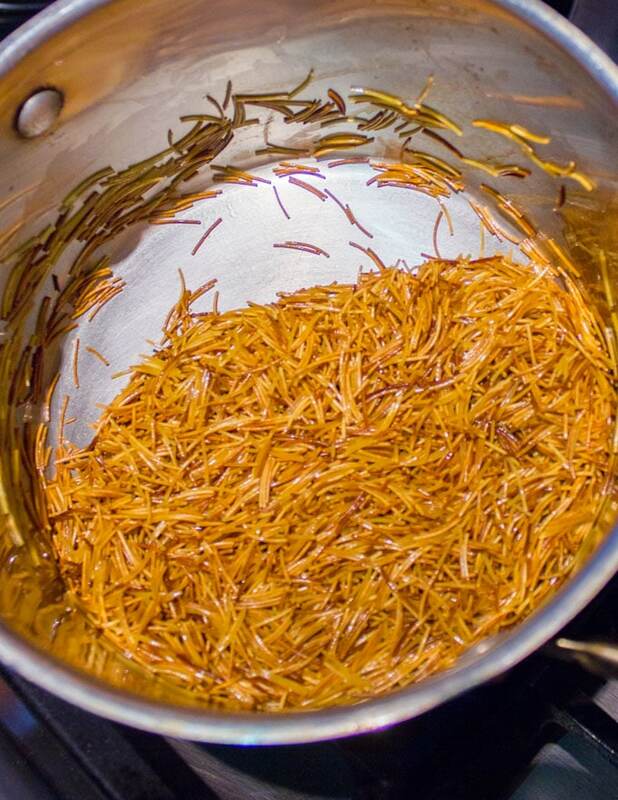 -Less is more when it comes to the spice blend, garlic slits and wet marinade. Overpowering the lamb may make it bitter, too dark and not as flavorful. 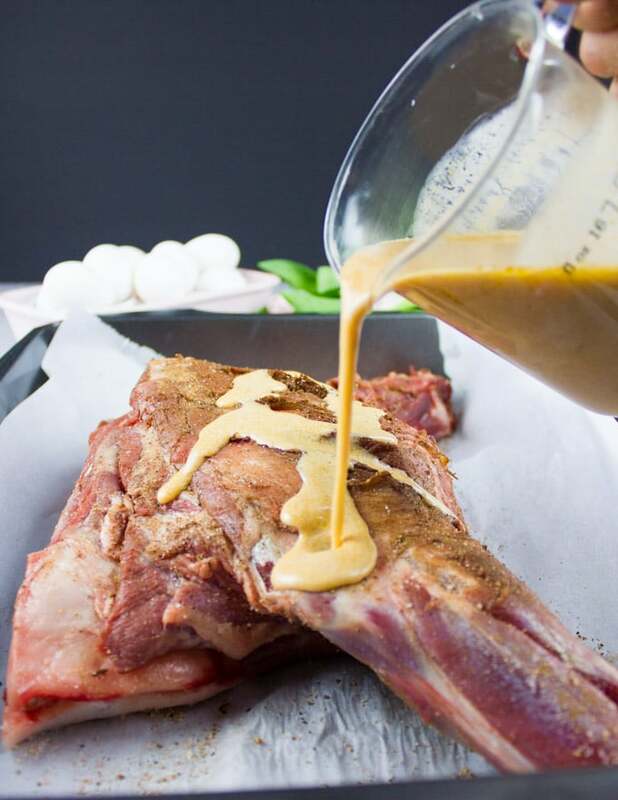 -Ideally the lamb shoulder marinate over night, but a minimum of 3 hours is also ok.
-Roast the lamb covered, it will still have a nice crust and will be extra juicy. -This recipe is very forgiving, so don’t stress because the lamb shoulder may look like a large cut. Start with the lamb. Pat dry the lamb. Make about 8 slits in the lamb and insert half a garlic clove and cardamom pod into each slit. Mix the dry mix and rub the lamb shoulder all around with it. Similarly make the wet mix and massage the lamb with it all around. 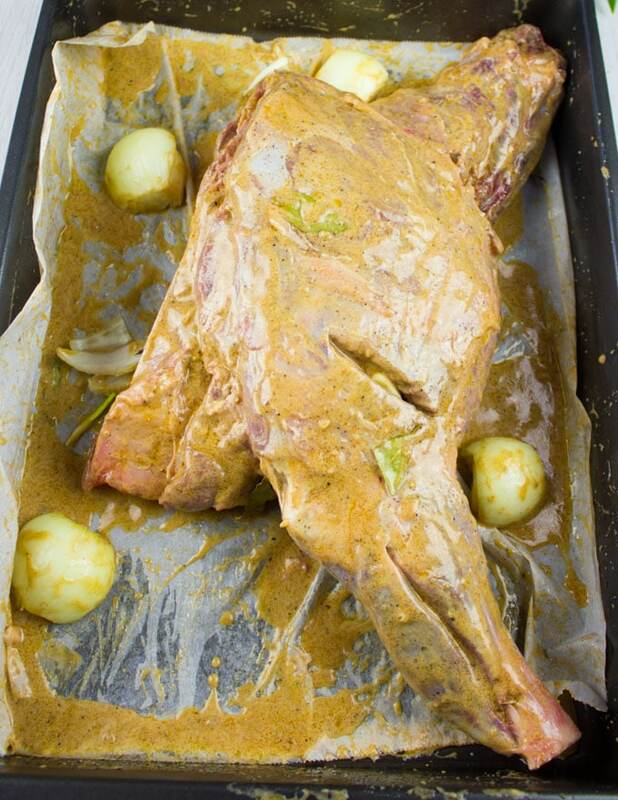 Place the whole lamb on a baking sheet over parchment paper and surround that with onions and fresh garlic. Cover the lamb and marinade for 3 hours at least to preferably overnight. Preheat the oven to 350 and add the stock to the lamb, cover the lamb entirely and roast for 2.5hours to 3 hours. In the meantime, start cooking the rice by sautéing it in some live oil and add the seasoning. Then cook the rice with hot water over low heat. Prepare the peas and potatoes. For the noodles, sauté them in some butter until deep golden and then cook the nodes with some stock over low heat. Now the eggs, after hard boiling them, peel and sear them in the brown butter until golden. Let the eggs cool and then slice them in half. 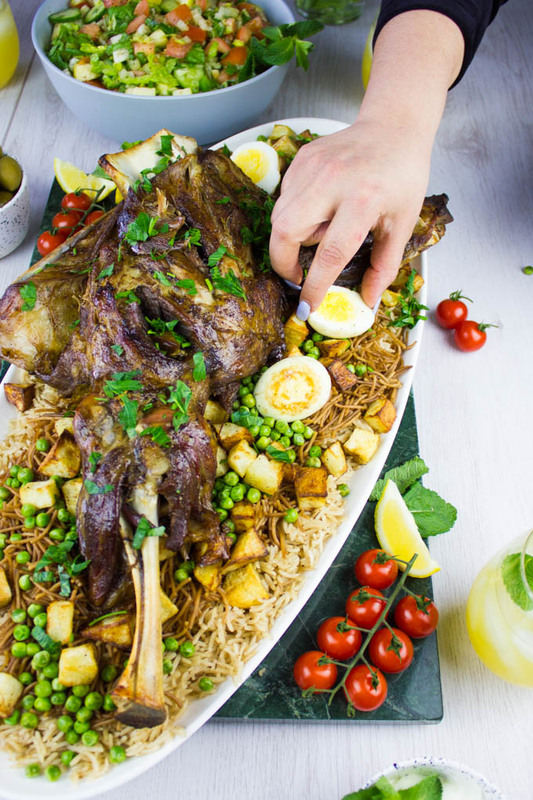 Assemble the Easter lamb dish by brining a large serving dish. 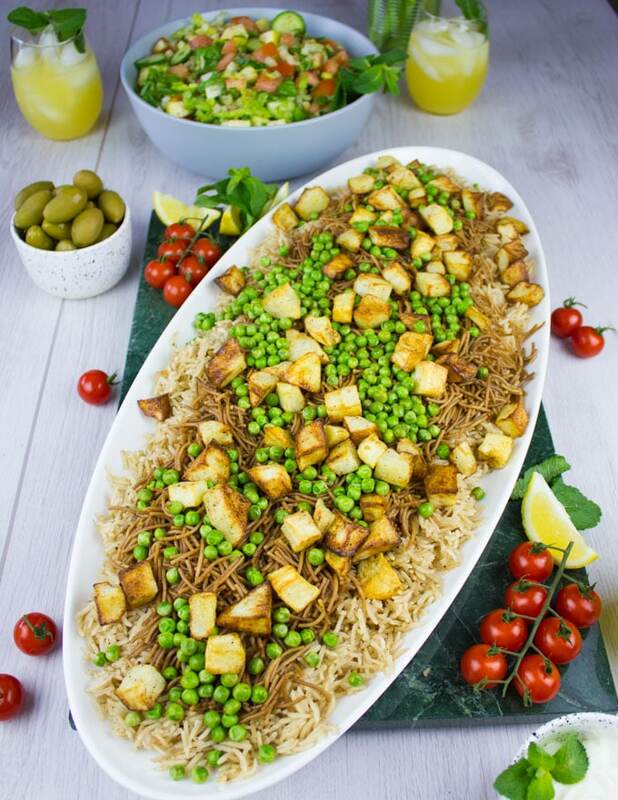 Start by layering the rice, topped with the noodles, top that with the cooked peas and potatoes. Now place the roast lamb shoulder over everything. 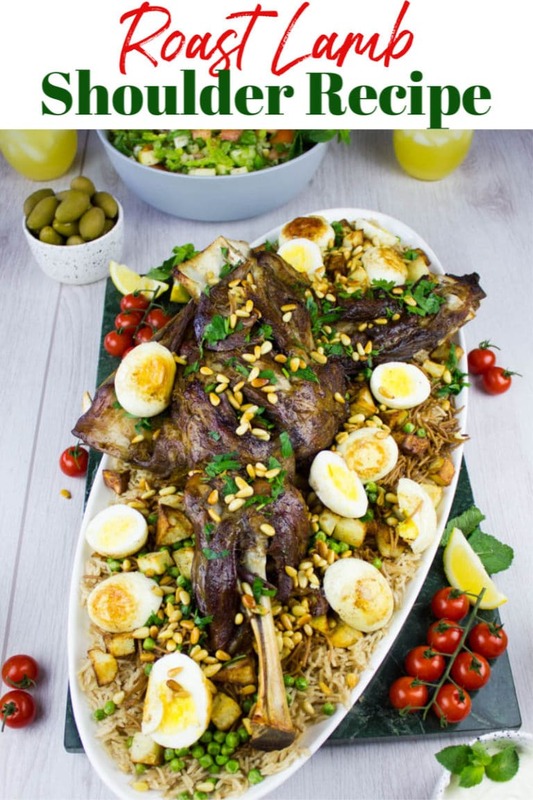 Arrange the hard boiled eggs around the lamb and finish off with toasted pine nuts and parsley. -Always buy American lamb with highest quality lamb meat. -Make sure to trim some fat off your lamb shoulder, but not all of it. 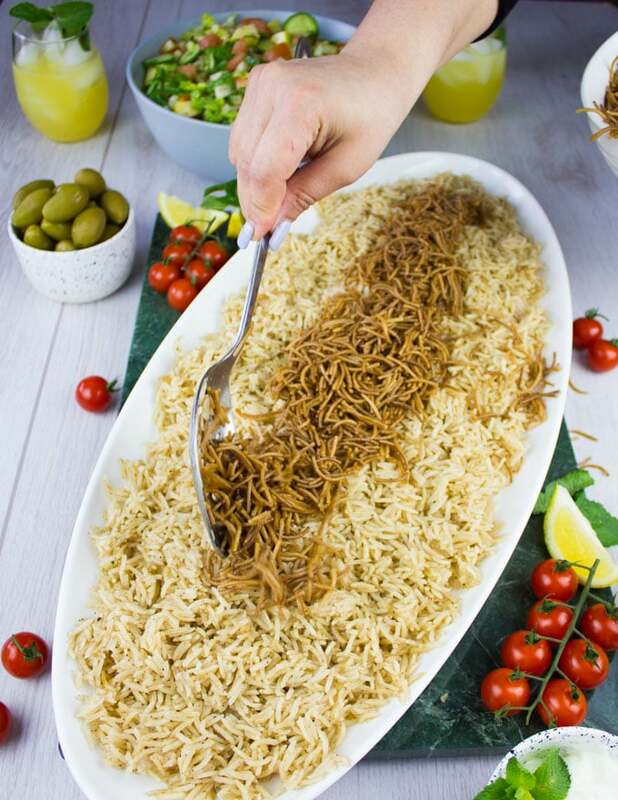 -Follow the flavouring steps of making garlic slits in the meat, a dry spice blend and a wet marinade for maximum flavor and super juicy meat. -Less is more when it comes to the spice blend, garlic slits and wet marinade. Overpowering the lamb may make it bitter, too dark and not as flavorful. 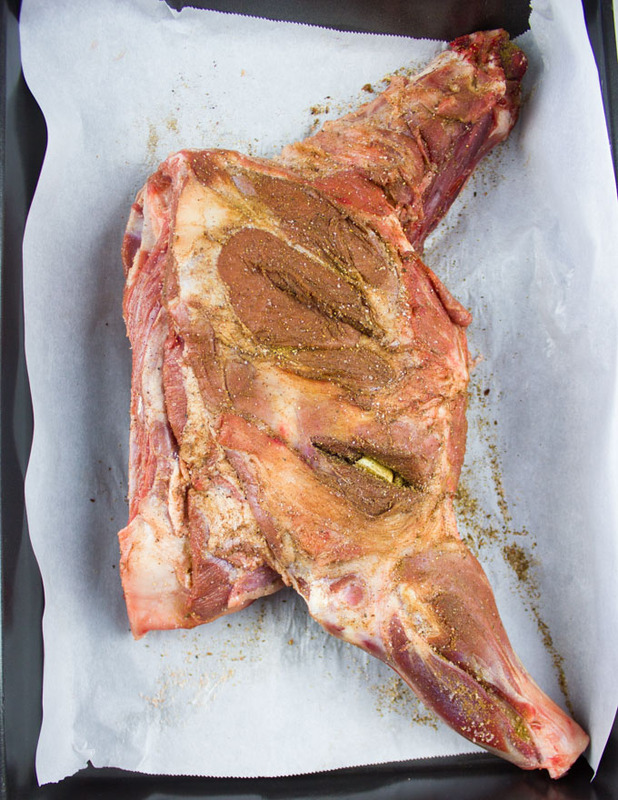 -Ideally the lamb shoulder marinate over night, but a minimum of 3 hours is also ok. -Roast the lamb covered, it will still have a nice crust and will be extra juicy. -This recipe is very forgiving, so don’t stress because the lamb shoulder may look like a large cut. What an awesome recipe. I could not believe how amazing all the flavors were here. the lamb is so juicy and succulent. This is totally an amazing Easter dinner recipe! Your lamb looks delicious and that table with everything looks incredible and so pretty! Must make for Easter!! 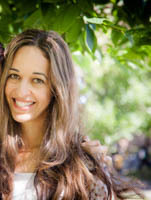 Lora, hope you try it! Wow everything on that table looks fantastic. But lamb meat is definitely a star. I love how tender and delicious it looks. Love the seasoning you used for the meat. It’s perfect for Easter. Thanks Natalie! 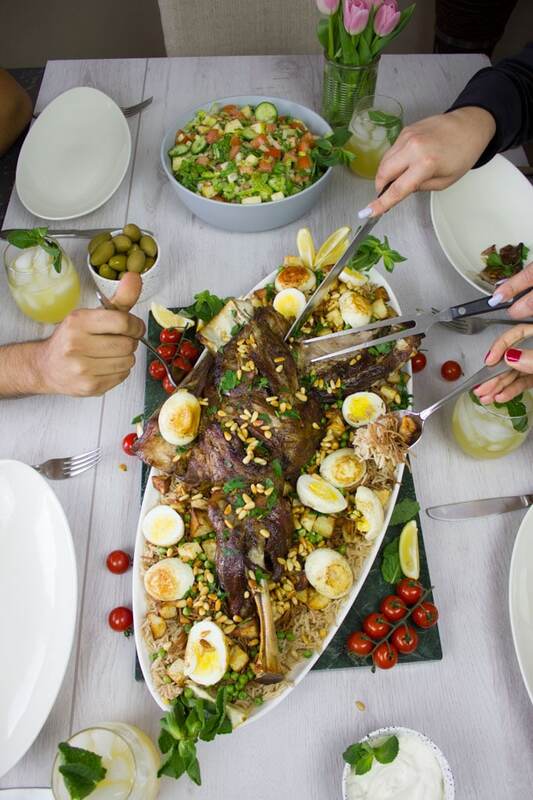 Lamb is always the star of the table!